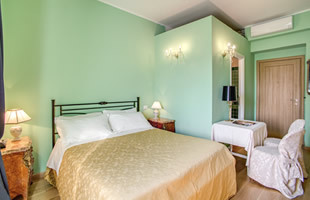 The Residenza Dei Principi Rome is a great value for money Bed & Breakfast in the centre of Rome at Piazza Viminale, just a few moments from the Opera House and with excellent access to public transport links. In fact, it is hard to imagine a location better served by public transport with Termini station just 10 minutes walk away that offers direct links to the city’s two airports by train or coach, a bus station, national and international rail links, tram links and access to the city’s underground metro system. Even closer however is the Repubblica metro station from which guests can take the underground metro to the Vatican in just 10 – 15 minutes with the minimum of hassle. 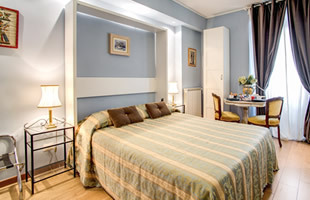 The Residenza Dei Principi Rome offers 4pristine and comfortable en-suite rooms available as either a double, triple or even quadruple occupancy. Each room is decorated and furnished in a renaissance style with a relaxing colour palette and rich fabrics which convey a sense of classic serenity. Each room also the latest modern conveniences including flat screen TV and free WI-FI internet access, and one of the rooms even offers a fully equipped kitchenette – ideal for a family. Discover more in our Rooms & Services section. 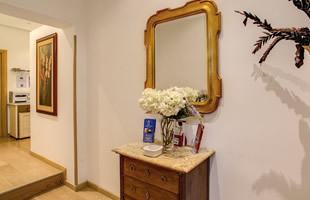 To make your stay as comfortable and enjoyable as possible, the Residenza Dei Principi also offer a variety of services to our guests. The most notable of these is our complimentary buffet breakfast to all guests served in our breakfast area which is included in the room price. In addition, we also offer an airport shuttle service, tourist information & booking services and more – check out our Rooms & Services section for more information. Many attractions are within walking distance such as the Trevi Fountain, the Basilica of S. Maria degli Angeli, the Opera House, Palazzo delle Espozisione, Quirinale Palace, Piazza Venezia, the Imperial Roman Forum, Monti and the Coliseum. Perhaps the best thing about our B&B is its optimal location. Situated just 200 metres from the famous square of Piazza Repubblica guests have everything they could wish for on their doorstep, from the latest fashion shops of Via Nazionale and Spanish Steps, restaurants and bars of Monti, museums and art galleries a short walk away and the Opera House just around the corner. 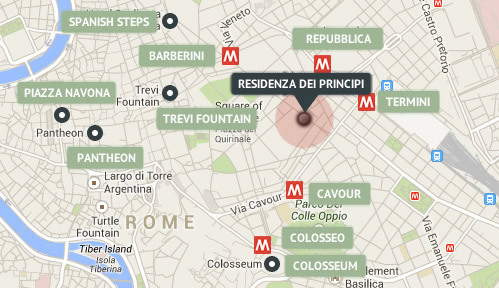 The Residenza Dei Principi is also within walking distance of the Trevi Fountain, the golden and ancient Basilica of Santa Maria Maggiore, the Roman Forum and the Coliseum. Learn more on our Location page.